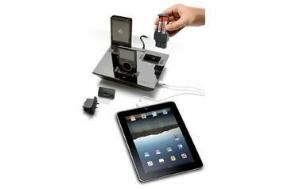 New iDapt 4 universal charger works with iPad | What Hi-Fi? Available from August, the iDapt i4 will cost £39.99 and comes in new gloss and metal finishes (black, silver and white). It can charge up to four devices simultaneously, is iPhone/iPod/iPad compatible, and works with 4000 different devices, including mobile phones, sat navs, MP3 players and Sony PSPs. Each of the three charging ports on the top has an LED indicator, and six adapter 'tips' are supplied as standard to fit a wide range of popular devices such as Sony, Nokia and Samsung mobiles. Additional tips (there are 25 in total) can be bought at extra cost.